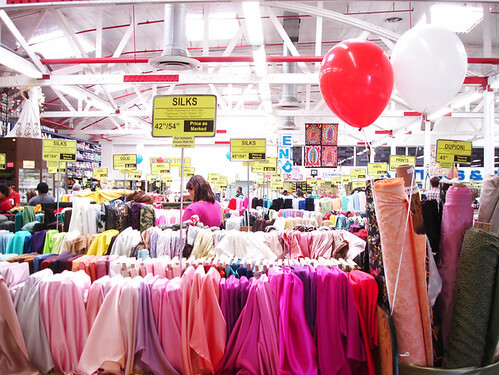 my aunt took me to michael levine's last week: the "largest fabric shop in downtown LA" as their website claims. it was so intense! think joanns times 10. i managed to snap a couple shots before my camera died but just wanted to share this amazing store with you. 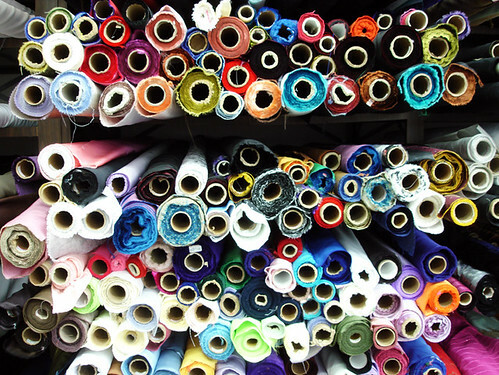 it's like, fabric heaven! i picked up some beautiful ivory and mustard gold linen, $14 a yard. it was so lovely, i couldn't resist. if you ever make it out to LA, you should stop here. lovely photos danni! i esp like that last one. you did walk across the street and check out the $2 a pound store, right? I love that place! oh lovely picture ! We don't have any good fabric store in Montreal :( Or printer fairs. Very jealous ! You can also get the fabric wholesale if you have a resale license. Which is awesome because I seem to always pick out the most expensive fabric! Oh how fun! i haven't thought about that store in a while! I had the privleged to go wedding shopping there and being as I used to live in central california we would make the trek down once a year or so! Thanks for sharing. That's where I got all our wedding fabric from. I made flower necklaces and the invitations had gold silk. Its so easy to spend so much there though!